Thomas is patron of blind people, probably because of his own spiritual blindness. 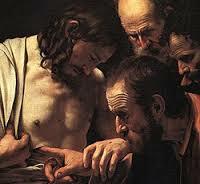 “Doubting Thomas” has become a much-used phrase in many languages. It recalls the apostle’s disbelief on hearing that Jesus was risen from the dead and his combative desire for proof. Well, he got it! Patrick Duffy explores some perspectives on this endearing apostle. In John’s gospel, Thomas (called the Twin) appears as a mildly combative character with a wry sense of humour. When Jesus explains that Lazarus is dead, and then goes on to say, “Let us go to him”, Thomas exclaims, “Let us all go with the Teacher so that we may die with him!” (Jn 11:16). Again, during the discourse at the Last Supper, when Jesus says, “You know the way that leads to the place where I am going,” Thomas objects, “Lord, we do not know where you are going; so how can we know the way to get there?” Jesus brings the discourse to a new level when he says: “I am the way, the truth and the life” (Jn 14:4-6). In each of these incidents Thomas is used by the evangelist as a literary “fall guy” who ironically brings about a fuller understanding of who Jesus really is. Thomas is best known for this role in verifying the resurrection of his Master. 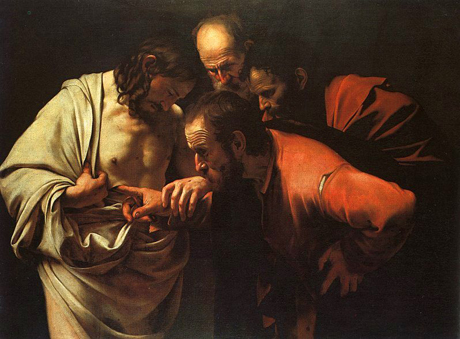 His resistence to believing that the other apostles had seen their risen Lord on the first Easter Sunday merited for him the title of “doubting Thomas”. Eight days later, on Christ’s second apparition, Thomas was gently rebuked for his scepticism and furnished with the evidence he had demanded – seeing in Christ’s hands the point of the nails and putting his fingers in the place of the nails and his hand into His side. 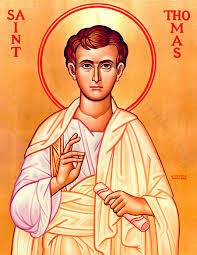 At this, St. Thomas became convinced of the truth of the Resurrection and exclaimed: ‘My Lord and My God,’ thus making a public profession of faith in the divinity of Jesus. St. Thomas is also mentioned as being present at another resurrection appearance of Jesus – at Lake Tiberias when a miraculous catch of fish occurred. This is what we know about St. Thomas from the New Testament. Caravaggio’s masterly oil on canvas painting of the drama of the disbelief of St Thomas, painted in 1600, is in the Cerasi Chapel, Santa Maria del Popolo, in Rome (see image). This depiction of Thomas is physically quite shocking and the scene must have touched Caravaggio deeply. It pushes curiosity to its limits. Four heads unite in the quest for truth before Thomas can say, ‘My Lord and my God.’ Christ’s head is largely in shadow, as He is the person who is the least knowable. He also has a serene beauty that is lacking in the frowning faces of the apostles. The shocking image of the finger exploring the depths of the lance wound is softened slightly by the guiding hand of Christ, which seems to push Thomas’ finger deep into the wound. It is the supreme proof that Jesus is God. 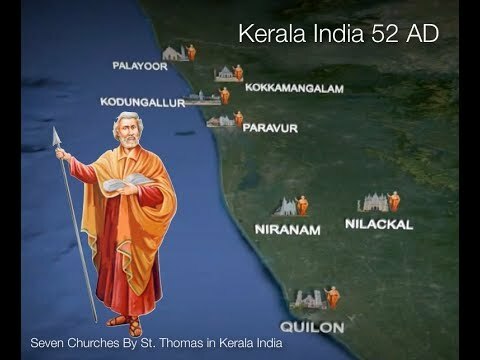 Tradition holds that when the apostles scattered after Pentecost, Thomas went to evangelise the Parthians, Medes, and Persians (Eusebius) and that he ultimately reached India, bringing the faith to the Malabar coast, which still boasts a large native population calling themselves “Christians of St. Thomas.” Marco Polo reported that both Christians and Saracens went on pilgrimage to his tomb and when the Portuguese first landed in India in 1498 they found established Christian communities there. Three apocryphal (that is non-canonical) gospels use the name of Thomas. The Acts of Thomas tell stories about his going to India and about his life there. The Gospel of Thomas has some saying of Jesus as well as miracles. The Infancy Gospel of Thomas tells of some miracles worked by Jesus as a child. Thomas is patron of blind people, probably because of his own spiritual blindness. A story from the Acts of Thomas that he built a palace for a local king in India led to his being named patron of builders, of architects and quantity surveyors.